Sally and Matt got married at Deer Park Hall in Worcestershire. The weather for their wedding was hit and miss, was rain threatening throughout and a really persistent strong wind. Despite being relatively warm, most of the guests chose to stay indoors during the drinks reception, and I was lucky to get them back out again for the formal photos! 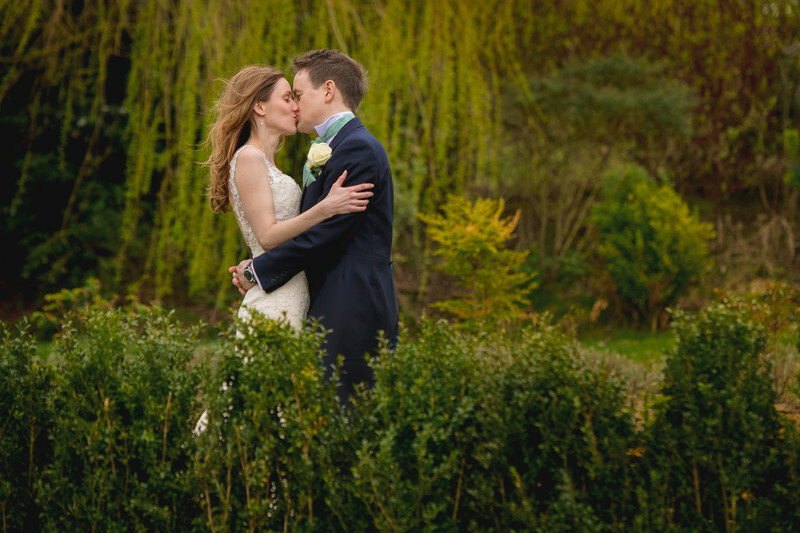 Sally and Matt however had no second thoughts before going outside for their photos however, and they weren't going to let a couple of strong gusts stop them from making the most of Deer Park's beautiful grounds. Because it was early in the year, the flowers that normally adorn the gardens weren't in bloom, but the deep greens of the deciduous trees and bushes set off the white of the brides' dress and the blue/green of the groom's cravat perfectly. The light levels were getting lower and lower, but for this one particular photo it seems like the patch of ground that the bride and groom are standing on is receiving just a little more light than the surroundings, making the couple stand out even more. Deer Park is a wonderful Worcestershire Wedding venue all year round, with ample space indoors should it rain. Luckily, for Sally and Matt's wedding we didn't have to call upon this available space, and the couple managed to have all of their photos outside.